Scenario: Professional Research Consultants, Inc (PRC, Inc) is a main sponsor and contributor to the Excellence in Healthcare Conference. Each year customers and vendors regularly visit the booth. The conference is more about visibility and customer retention than lead generation. PRC, Inc is seeking a unique giveaway or activity that would generate a buzz on the trade show floor. Goal: Find a unique giveaway which illustrates the corporate marketing statements of how their survey collection system is not “very good”, but produces “excellent” results. Conclusion: PRC, Inc worked closely with Dale to establish a pre-show marketing campaign, while allowing Dale’s creative artwork to attract people to their booth. Dale’s visual art was stimulating to watch and provided a unique giveaway, incorporating the PRC, Inc mission statement of only providing the best inQuality, Service, Collaboration, Innovation, and Growth. Looking into the exhibit booth, you see sales staff processing orders. Standing in front, is a gray-haired CEO whose eyes are fixated on the hands of Magical Balloon-dude Dale. He watches as a red balloon twists and twirls, until it transfers into a work of art. In the aisle, perspective customers are gathering, watching, listening, and participating in the presentational entertainment. 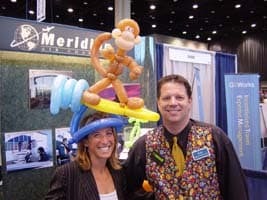 Your ears detect a balanced sales pitch between professional product representative and the good-humored balloon entertainer. The sales staff is communicating with clients, gathering leads as foot traffic stops in the aisle. Attendees smile, point, and listen to Dale’s sales patter then presents them with a unique balloon sculptured specifically for that individual. In return, they provide a business card, swipe a badge or direct others towards your booth. You observe balloon sculptures that instantly become eye-catching pointers as engaging perspective clients ask detailed question of the sales staff. Vendors from across the exhibit floor are asking if they can have a balloon for their booth. In exchange, they will display it and direct people to you. a Twist to a Sales Pitch! Take traffic building to a new level. Have your meeting planner or event producer contact Dale about availability for your next trade show.